A grieving son has branded a council as "extremely insensitive" after receiving a letter about his mother's council tax bill. The letter to 95-year-old Ada Davies said she would no longer get a reduction as she had "passed away". Her son, Christopher Davies, from Bristol, said: "It says dear Mrs Davies the reason for the calculation is that you've passed away." South Gloucestershire Council said it was extremely sorry for causing upset. "Shortly after her death, I received a letter from the council saying that they had ended her reduction for council tax and she still could claim for a reduction if she'd like to ring them up and complete a form and send it off with proof of earnings, which is really bizarre. "It was very upsetting at the time, and when you're going through your own emotions it was extremely insensitive," said Mr Davies. Mrs Davies died on 27 February. 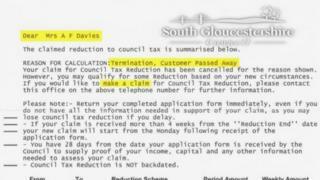 The first letter was sent on 6 March informing her she had lost her council tax reduction, despite her son telling the council about her death. After Mr Davies' complaint about the first letter, his mother then received a second one dated 15 March. This contained her council tax bill for the next financial year, without the discount. He said he now wanted to prevent other families from being treated in the same way. "It may very well be an automated system but it doesn't take a lot to see that if the reason for deduction is death, don't print or don't send, it's simple as that," he said. A council spokesman added: "We have updated our records to ensure that this incident doesn't happen again and we would once again like to thank Mr Davies for bringing this to our attention."